Hasbro is releasing a Stranger Things-themed Dungeons & Dragons starter set to help you kill time before Netflix drops the third season. 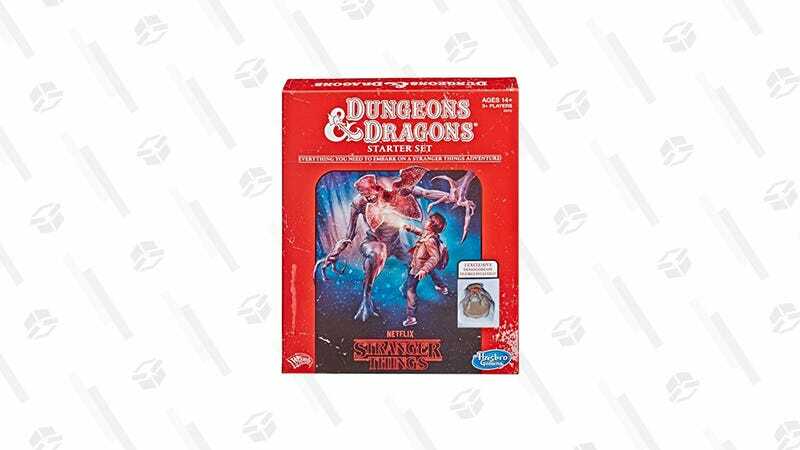 Right now, you can pre-order Hasbro Stranger Things Dungeons & Dragons Roleplaying Game Starter Set for $25. In addition to all of the necessities you’ll need to start (a rule book, dice, character sheets, etc. ), you can also look forward to the “Hunt for the Thessalhydra,” the scenario dreamt up by Mike Wheeler and played during the show’s first episode. This kind of crossover is the type of thing you kind of knew was bound to happen (seeing as Stranger Things ostensibly brought D&D back into the mainstream) but you’re still stoked when it does. Stranger Things fans and D&D enthusiasts can all share in the terror of facing the Demogorgon when the set arrives in May.